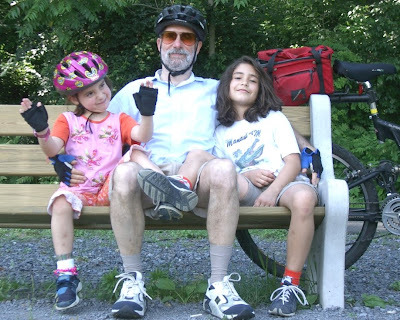 I read what you wrote on the blog about biking and surf mats in pools which also struck home. I don't often get to actually surf on the mat and when I do, my arms are usually shot in short order. So last January I started training in my local community pool - with the mat. They weren't going to let me use it at first because they have a rule against inflatables. I explained to the pool manager that I was training for surfing. After he heard my explanation he said he would allow me to use the mat. I've been training basically 2 to 3 days a week there ever since. This also comes to mind: I started mat surfing a little over a year ago. (I already knew how to surf with a board before trying the mat.) So far, it seems very natural to me to be on the mat, surfing. I can control the mat and go where I 'will' it to go. I honestly can't explain exactly what I do to control the mat. I ride a mountain bike every day to work and back (about 2 miles each way). I ride no matter what - rain, and snow unless it's too deep. In the snow you really have to be conscious of your balance - minor weight shifting in the wrong place or wrong time can be unhealthy, ie; you fall. Somehow I think the weight shifting/awareness in the bike riding has helped my mat riding. Just a theory, but it's the only way I can explain why surfing on the mat seems so natural to me. This is a Standard 4GF made out of canvas. Since the modified three pontoon concept worked so well with nylon fabric, it was worth a try. I even threw in some brass grommets and perimeter rope! Not only did this mat ride nowhere near as well as a nylon 4GF, it wasn't as good as a Converse Hodgman in head-to-head comparisons. Which reinforced what we were beginning to suspect at the time...that each material calls for a different configuration of dimensions, pontoons, and I-Beams to maximize it's potential. Mats courtesy Florian Morlat collection. During the summer of 1985 -- after the Standard 4GF shape had already evolved into what we were riding all the time -- I tried a couple of further experiments. This time, altering the bottom texture of the nylon mats. I covered the bottom of two mats I had laying around with urethane. The idea was to see if a smoother bottom would enhance the performance of the mats. Both mats surfed noticeably slower, and their inflation levels were much touchier to get right on any given day. And, both mats exhibited less glide. Presumably, the reasons was because the mats were stiffer and wouldn't relax and conform as easily when you let them flatten out. Plus they sometimes had to be ridden firmer -- since the smoother bottom fabric didn't hold in as well -- and this slowed them even further. The red-bottom mat was slightly better, which made sense since the red urethane was softer. But both were real turkeys! One other test was conducted. I fine sanded the sheen off the clear-bottom mat with 320 W/D, to try and regain some of the "wetted-out" feeling the slick urethane bottom had removed. The mat was improved somewhat, but it was still a long ways from being as good as the taffeta-textured nylon. After a couple of weeks riding theses mats, I took a stock 4GF nylon mat out and couldn't believe how well it worked, or how good it felt! 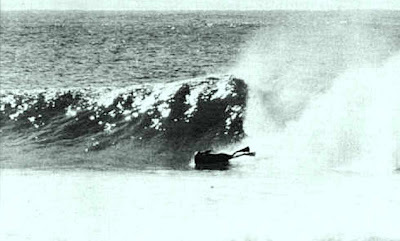 The hand scoop was a technique Greenough used to employ, especially riding weak waves with a fresh (meaning stiff and unbroken in) Hodgman raft. He would square up to a small section, reach forward with his inside arm, and pull himself forward through the section. This sequence is from Innermost Limits. It's worth watching in live motion. You can really see the concept working. As different as cycling and surfing (with swimfins) might seem, there's a way to derive similar fitness benefits from both activities. This is poignant for me, because we're now living in Eastern Washington -- 5 hours from the coast -- for an indefinite period of time. (Caring for my mother, who's 90.) The obvious way to stay in shape to ride a mat would be to swim with fins at the local Y... and I may do that, especially next summer when the inland heat turns unbearable. 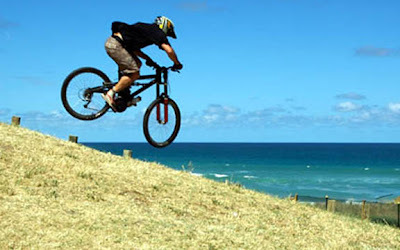 But there is a way to get tremendous benefit from cycling in a manner that relates to using fins. The key is the placement of your saddle. As you raise, lower, and move the saddle back and forth, different muscle groups come into play. You can't, however, do much about the muscle groups you use when you are swimming with fins...other than changing fins. So, what I started doing a few months before we moved up here was to kick as hard as I could for as long as I could on a mat. I paid close attention the what areas of my legs started to fatigue first. Then, I repeated the same process riding my bike. I climbed up hills in a seated position putting out as much effort as I could. Again, I noted what area of my legs became fatigued. I began to move my saddle around until the same muscle group (mostly the outer part of my quads) fatigued first. I rode hard for a few weeks. Then I went for a mat surf. It felt like I had been in the water a couple hours every day...both in leg strength and "wind." Cross training in this manner really worked! Generally speaking, the further forward and/or lower the saddle, the more effort is transferred to the upper parts of your legs. A higher and/or further back saddle shifts the effort to your lower legs. There's nothing new about these observation...and, this is an oversimplification. Further, it's important that your bike saddle position be comfortable when riding longer distances. There's some fiddling involved, and it take a lot of miles to really get it all fined tuned. 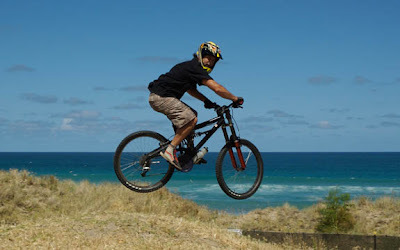 No one, least of all me, is saying that riding a bike is as fun as surfing...but it's a good alternative, with added fitness benefits for anyone who surfs or swims with fins. A variety of mats and riders leaving nice lines across wave faces. His head is at the front of the mat, his left hand has a firm grip on the side of the outer rail, his weight is focused on the inside rail, and his fins are up...with the inside fin poised to drop into the water when called for. Notice how there's no water wrapping around the outer/back part of the mat. Even on this big, heavy, stiff mat, efficiency is possible. Because George is so thin, and the mat he's riding is so large (the Converse/Hodgman Stripes Down model), the positioning of the rider on the mat is exaggerated...which is good in terms of a graphic example of this style of riding. Because most mat riders are larger and today's mats aren't as wide, the positioning shown in contemporary shots isn't as well defined, visually. Even under full power, there's a huge benefit to unweighting just as you reach terminal drop-in speed...and letting the mat fly before burning off a bottom turn. No happy ending here...but plenty of ragged, burning, flat out speed running across a closed out wall! Fun!!! 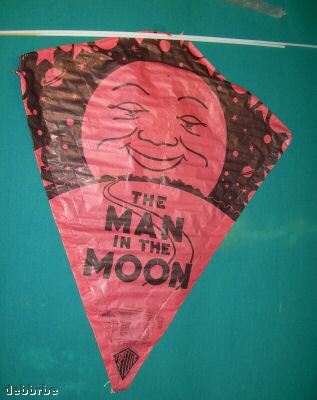 Remember, back in the day, when you tried to fly a stick-and-paper kite without a knotted cloth tail? And how the kite would violently yaw back and forth? In many ways, the mat rider's legs and fins function like the tail on a kite. Even when your legs are out of the water, they counterbalance the mat's tendency to drift laterally. 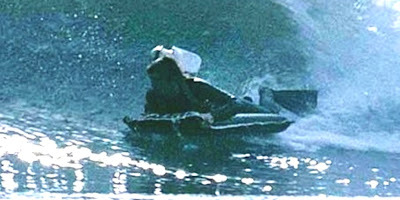 A carving cutback with fins in the water, and left hand dragging and providing a pivot point. 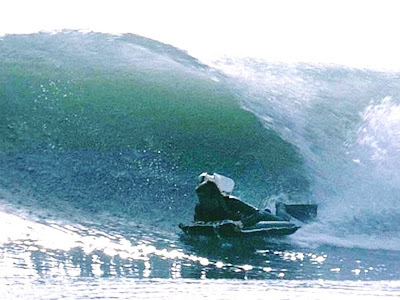 A flat, drifting cutback with fins out of the water. A carving cutback with fins out of the water. A carving cutback while dragging one fin to control the arc. Using the inside fin for directional stability. Lifting the inside fin to allow the tail to slide out. Both fins are out of the water... and the mat is in full side slip. The inside fin is lowered back into the water to check the tail slide. Two identical flat bottom turns -- 1969 and 1985 -- and two identical uses of flipper drag. In both instances, the outside fin is clear of the water. The inside fin is lowered "horizontally," and just enough to rotate the mat "around the corner"of the turn. A speed run into a building section. Both fins are clear of the water. 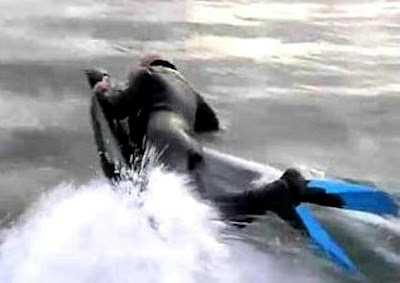 A quick dip of the right flipper tightens the rider's line into the face. Both fins are released for maximum speed. The adjustments for wave altitude and angle of attack have already been made before the wave crests. All that's left is to sit back and enjoy the ride! Great technique: Outer hand compressing the mat's inflation level, inner elbow almost but not quite touching the water, inside flipper dipping in. Tre' bitchin'! Nice, moderate turn, bank-wise. Just the right amount for the situation. Greenough...late 60's...Converse/Hodgman "Stripes Down" mat. The offshore texture provides enough tension so he can bank all the way over without his fins touching the water. Tightening your grip on the outer front corner and burning a turn off the bottom feels great. And on the right wave, it can generate a gear jump...or two! A mat's trim speed can sometimes be maintained, or even increased, with a yaw turn off the bottom...rather than a banked turn. By running along the bottom and easing the nose back up the face just a few degrees, while leaving the mat level, the tail will drift out a bit, and you can take a natural track back up the face and into the power. The flat turn in the top photo was initiated to keep the camera angle level while shooting point-of-view footage for Innermost Limits...but the turning principle is the same. The middle photo was taken in weak windswell -- you can see the short wave frequency in the photo -- but no speed was scrubbed off in the turn. A banked turn would have bogged the rider down. The bottom photo is a textbook "flat" bottom turn. Look how little the water is disturbed as the mat changes direction. An analogy between the two styles of bottom turn would be a car versus a motorcycle, both racing on dirt. Each would drift and hunt for the right line, but the motorcycle would bank over into the turn and the car wouldn't. Neither is inherently better, but with a mat, you can execute both kinds of turns as the wave and your mood dictate. When I read the comments on greased pigs, I knew sheep jokes were next. 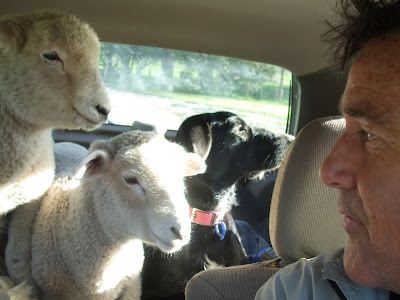 Well, mates, for the record, sheep are for eating. These two lambs, named Steak and Chops, are destined for the Christmas dinner table! Please keep in mind, you horny old goats, that Surfmatters is meant to be a good clean fun blog for the whole family. Regarding sheep in tall grass, the Kiwis who I know find them to be delicious. 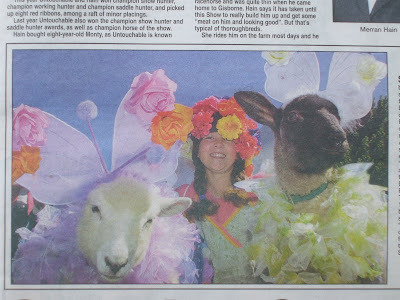 As you can see in this newspaper clipping, New Zealanders take their livestock very seriously. Over the years I have called in various sea creatures by rubbing a finger on my mat to make the acoustic envelope vibrate with cetacean-like sounds. Seals, otters, gray whales, pods of dolphins, penguins... have all come around to check out this unique bladder instrument. And today -- an orca took interest in my mat music! I was sitting out the back waiting for a wave as two orcas, 25' and 15', lazily swam by about 20 yards away. 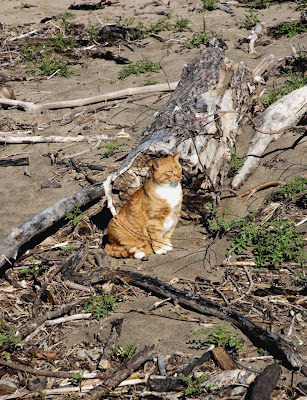 Foolishly, I strummed my mat, and junior instantly veered straight toward me before submerging. "Uh oh." A series of boils on the surface of the somewhat murky water advanced in my direction. Upwellings from the orca's massive tail. "Okay, remain calm." The boils closed in on me. "Too late to do anything now." A pool of turbulent water rose up directly on my righthand side. "It's just like a really big dolphin." Another upwelling appeared to my left. "What the hell did I do that for?" Then the "footprints" trailed away until the curious young orca came up for air and calmly rejoined the adult. "What's the matter with me, anyway?" Of course it's wise to be friendly toward anyone much bigger than oneself, but it wasn't very bright of me to call over someone who could eat me in four bites, was it? Greenough talks about running in 3rd gear, and being able to surf through a single section of a wave three times. If enough speed is in hand, he can glide over the top of a section as it's forming, cut back across it as it crests, and run though it again (heading down the line) as it breaks. The above photo is a perfect example of third gear mat surfing. This is one of my favorite mat shots. The wave was in a protected cove. The swell was moving very slowly toward the beach, and there was no curl line, pocket, or surface tension. George caught this wave further up the point, and double-clutched the take off...meaning he didn't drop straight in, but started out across the top of the wave face, then dropped in after he had gained some speed, but not all the way to the bottom. 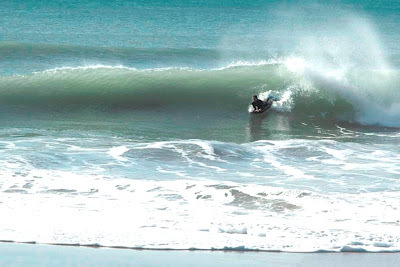 He reset his lateral line halfway down the face, let the mat run "flat," broke loose into third gear, dropped down to the base when the wave stood up a bit, pulled it off the bottom, and tore across the top of the wave. The track you see is left over from his bottom turn. It's a ruler straight line. It looks like a sailboard track. That's how fast he was going. I showed this picture to the photo editor of a surf magazine back in the late 80's, and explained why I liked it. He broke out laughing.